“When they smile, and it’s genuine, it actually picks my day up,” says an enthusiastic Jerred Thill. ALBUQUERQUE, N.M. (KRQE) – It’s been one problem after another. An Albuquerque neighborhood has had trouble getting their hands on their daily mail, and it has just gotten worse. WEST LINN, Ore. (KOIN) — Jared Hess delivered more than the mail on his USPS route in West Linn Tuesday. He delivered the fire department. NEW YORK (CBSNewYork) — A postal worker was caught on surveillance video making an apparent half-hearted attempt to alert a Queens family about a package delivery. Milwaukee Letter Carrier Mike Boothe began a recent day under the impression that a local TV station was planning to follow him around for a story about delivering mail in cold weather. 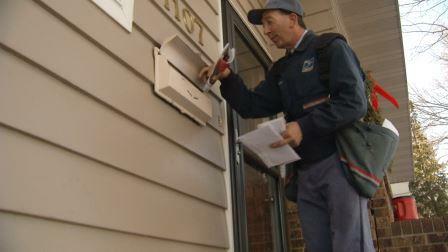 Louisville — Jim “Bo” Warner started his job as a mailman back in 1974. Neither snow nor rain nor heat nor gloom of night can keep this ray of sunshine from his route or recipients. He’s fast. He’s quick.He might be faster than any other letter carrier in town. “He’s always efficient, very efficient,” says Shari Masse. “Dewey is the greatest,” says Karen Volk. Dewey Reinert has a reputation for being quick on the job.”He makes sure that you get your mail on time all the time. He will even go the extra mile if you’re not home, he comes back again,” says Masse. 12 miles to be exact, that’s how far the 45 year old letter carrier walks everyday when dropping mail at 380 houses along his route. He goes through six pairs of shoes a year, knows everyone on his route by name, and hasn’t missed a day of work in 17 years.